When I am asked who I think was the most ethical President of the United States, my answer is the man whose birthday President’s Day preempts: George Washington. He was not our most brilliant or eloquent President, and it often took him a while to find his way to the right thing to do, slavery being the most important example. Still, the United States was extraordinarily fortunate to have such a principled and instinctively wise leader as its first. He created the template that, though weakened by time and inferior successors, continues to exert a powerful influence over our choice of Presidents. He was honest. He was civil. He was dignified and insisted on respect, but never worship: his simple decision that America’s Chief Executive be called, humbly, “Mr. President” had immense consequences for the nation’s attitudes toward executive leadership. 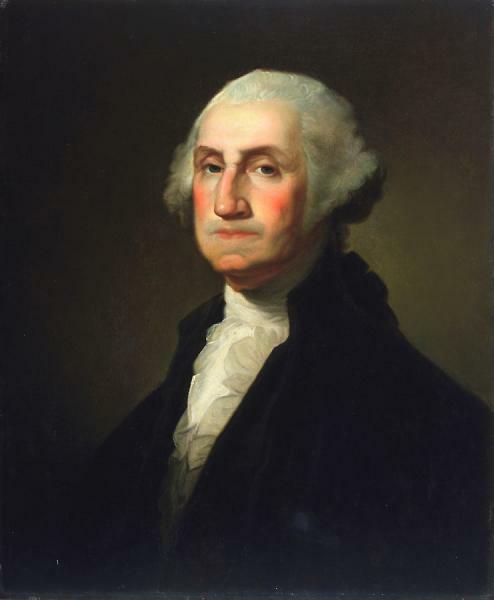 Perhaps most important of all, Washington was a gifted leader but a reluctant one. He believed that a citizen should heed the nation’s call when needed, but he was a reluctant public servant, and condemned those who sought power for its own sake. I am always amazed, when I return to Washington’s writings and speeches, how sure, persuasive and perceptive his statements remain, so long after they were made. Here are some of my favorite quotes from our most ethical President. Happy Birthday, approximately, General Washington. “No pecuniary consideration is more urgent, than the regular redemption and discharge of the public debt: on none can delay be more injurious, or an economy of time more valuable. Oh! So that’s who the 99% are! Okay, where did the 99% quote come from? A quick Google search isn’t helping much, and may indicate that it’s attributable to George Washington Carver, not President George Washington. Good catch. The quotes are from various sources, but that one was on a site I had some doubts about. The 99% was too tempting for me, but it doesn’t sound like George, does it? I can’t confirm it elsewhere, so I’m dinging it. Thanks. The mark of an honest leader of a third world country: he wonders how much longer he can afford to stay the country’s leader because he is going broke. I don’t think a man can be morally sound while forcing other men to do labor he profits off of. He owned slaves, signed a law allowing people to recapture slaves in free states that had abolished slavery, and provided military & financial help to French slave owners putting down a rebellion in Haiti in his official capacity as President. I agree with the principals this country was founded on, equality for all, but his personal life just didn’t reflect that. Holding Washington, with his background, family, region and time, to a contemporary standard regarding race and slavery is wildly unfair and unrealistic. Washington’s attitudes toward slavery and slaves evolved, and that too is proof of his remarkable ethical orientation. I also think the problem with looking back at people and holding them to our standards is unfair. But I do think it is appropriate for us to look back and judge them based on what we now know but we shouldn’t look back and condemn them. The first allows us to learn from both their good and bad actions. The second just makes us dismiss all the good they did , how and why they did it and only focus on the negative in their lives. You know, you and I were born into a world where the moral and ethical verdict on slavery was settled—it was easy for us. It was pretty settled too in the countryside where Washington was raised—the other way. Yet he found his way to the right side. Would we have, in his place? Don’t be so sure. Exactly, Jack. What separates the serious scholar of history from the dabbler is his ability to put things in the context of the times he’s dealing with. All too frequently these days, people are led into “dabbling” as a political device by those who stand to gain by thus misrepresenting history. – guess who? George Washington. How do you reconcile that with your belief that pot smoking is unethical? Rather easily. 1) There was no law against it. 2) He did not have the benefit of the last half-decade of the devastation caused by drug addiction and societal acceptance of drug abuse. 3) Even the most ethical people can be wrong. 4) There is zero proof that George smoked the stuff. He was a farmer/planter, and hemp was an especially versatile crop, being useful for “a wide variety of purposes including the manufacture of cordage of varying tensile strength, durable clothing and nutritional products. The bast fibers can be used in 100% hemp products, but are commonly blended with other organic fibers such as flax, cotton or silk, for apparel and furnishings, most commonly at a 55%/45% hemp/cotton blend. The inner two fibers of hemp are more woody and are more often used in non-woven items and other industrial applications, such as mulch, animal bedding and litter…. Hempseed is also used as a fishing bait.” 5) You’re basing a lot on one quote, but I know the pro-drug lobby has loved this one for a long time. 6) What’s it like being so obsessed with a foreign substance that everything you see and think about comes back to it? Seems pretty pathetic to me. I seem to recall that hemp for ship’s cordage (VERY important for Britain in those days of sailing ships) was a major export item of America. Washington also owned one of the biggest breweries and distilleries in Virginia- right there at Mount Vernon. Yet, one hears very little about him “overindulging”. Smoking hemp for a cheap high wasn’t something respectable people did back then, anyway. Nor should they now. Despite the fact that my views on drug legalization are probably closer to yours than Jack’s, I’m going to have to agree with Jack…no one should be that obsessed with marijuana. Also, according to your logic, it would probably be also be ok to be racist, since a lot of great men (Jefferson in politics, Galton in statistics, etc.) have held rather noxious views about Africans. This is something I didn’t bring into the last drug assault, Julian, but I wonder—if pot isn’t addictive, if it is so benign, why are its advocates so monomaniacal about it? I mean, I like Hostess cupcakes, but I go months without having one, and unless I’m buying or eating them, I don’t spend any time thinking about them at all. If you’re thinking that much about getting stoned, you’re not thinking enough about more important things, like, oh, everything. If Corned Beef was made illegal tomorrow, I would be firebombing blogs about it for the rest of my life. A basic justice is not paid attention to, but an injustice sticks out like a sore thumb. That obsession I can relate to, This is not, for most of the obsessives, a justice issue. i”ll accept the obsession from a non-drug user, but I’ve checked out the Facebook pages of a lot of these zealots. It’s not justice; it’s getting stoned that they’re obsessed with. If you were obsessed with eating corned beef, I’d think that was unhealthy too. I eat corned beef frequently. It is my favorite of the deli meats and a great comfort food. As I eat sandwiches at lunch pretty much every day, I probably eat corned beef close to 100 times a year. Does that make me unhealthy, and/or would it invalidate my opinion on the unfairness of banning corned beef? Are Christians the same? Is the bible physically addictive? Ask certain people about pizza and they say the same . When someone insults something you enjoy and is part of your life , and more than that they tell you is damaging and wrong of course you’re going to lash back. The requirement for trying it is hogwash. Whether someone enjoys X or doesn’t enjoy X has no bearing on whether the X is accurate or should be legal. The first two paragraphs, though, were a solid response. Your standards for “solid” are inconsistent then. “Are Christians the same?”—if all Christians were fanatics, then the answer might be yes, but since they are not, the question is a non sequitur. “Is the bible physically addictive?” makes no sense either. We’re talking drugs.Ideas and stories are not physically addictive, drugs are. “Ask certain people about pizza and they say the same.” Nut cases, you mean? Outliers? That wasn’t the point either. If you are obsessed with pizza, you have a problem–if a substantial proportion of pizza eaters became obsessed to the extent that they subscribed to pizza journals, only associated with pizza-lovers, attacked anyone who professed not to like pizza, and let pizza dominate their lives, then it would have some relevance. “When someone insults something you enjoy and is part of your life , and more than that they tell you is damaging and wrong of course you’re going to lash back.” The law does all of this already regarding the drugs in question. One should not “lash back” at the law. One is supposed to conform one’s behavior, no matter how much you enjoy lawbreaking. Your standards for “solid” are inconsistent then. “Are Christians the same?”—if all Christians were fanatics, then the answer might be yes, but since they are not, the question is a non sequitur. You’re the one that failed here. Not all pot smokers are advocates of it. That’s a subset. Your claim that all users of pot are fanatics is just plain wrong. Going back to the original point, If you look at the crazy Christianity advocates, they are similar in action to the crazy pot advocates. I called out the crazies specifically because of an inherent difference between Christianity and pot. Pot is illegal. Since Pot is illegal, vocalizing support for it has larger risk. That suppresses vocalization of support and sane advocacy. As a result, you see a larger percentage of crazies and fundamentalists in the pile of pot advocates without there being any need for a larger percentage of crazies in pot users than in Christians. I suspect that if you wrote a couple posts thrashing Christianity… using some good arguments and some bad arguments, you’d get hounded in the comments, and drivebys in other posts…. just like you get after pot posts. Is the bible physically addictive?” makes no sense either. We’re talking drugs.Ideas and stories are not physically addictive, drugs are. What the hell? You just begged the question. Some “drugs” are physically addictive. Some aren’t. Some activities are physically addictive. Some aren’t. For how this actually applies: you suggested pot is addictive because of the behavior* of it’s advocates. If the advocates of other things behave similarly, then you either have to suggest those other things are addictive or give up the logic. * The word “behavior” here is intended generally as a stand in for your complaints here about pot addicts.
. “Ask certain people about pizza and they say the same.” Nut cases, you mean? Outliers? That wasn’t the point either. If you are obsessed with pizza, you have a problem–if a substantial proportion of pizza eaters became obsessed to the extent that they subscribed to pizza journals, only associated with pizza-lovers, attacked anyone who professed not to like pizza, and let pizza dominate their lives, then it would have some relevance. You jumped from “advocates of pizza” to “a substantial portion of pizza eaters”. Are you claiming that of the 35 million Americans who admit to smoking pot in the last year, a substantial portion of them are advocates? I’d say a severe minority of them are advocates. I also suspect that if pizza were made illegal, you would have more people who appear to you to be obsessed with pizza, who associate more with people who back pizza, and who attack people against pizza. I see the difference here as a need. There’s no need to back pizza because it already is legal and isn’t greatly condemned. “When someone insults something you enjoy and is part of your life , and more than that they tell you is damaging and wrong of course you’re going to lash back.” The law does all of this already regarding the drugs in question. One should not “lash back” at the law. One is supposed to conform one’s behavior, no matter how much you enjoy lawbreaking. Bringing up violations of the law here is a non sequitur. The comment was about criticism and verbal/written response to that criticism. If you want to argue that I was unfair attributing to all pot users the fanaticism I was referring to, that’s valid—I’ll cop to that criticism. But Christianity, while it has its fanatics, is not an addiction except in the most metaphorical sense, and a book cannot be analogized to that which is consumed…nobody is truly addicted to a book. The pizza comparison makes even less sense. I have never encountered a pizza fanatic, and while some may exist, the comparison with pot-fanciers wearing cannabis T-shirts and giving money to NORML is useless. Today’s pot fanatic became fanatics while the drug was already illegal. The hypotheticals about how people will react if what was always legal for them got taken away or is threatened—guns is a better example—doesn’t apply. The illegality is central to the criticism. It’s not irrelevant. Your argument was that since advocates are so crazy about it, it must be addictive. That’s it. Nothing more. Nothing less. Marcus pointed out another topic (Christianity) that has similar crazy, fully integrated proponents, and asked if you applied the same logic. Instead of admitting that you don’t apply the same logic and that your SPECIFIC argument here is invalid, you responded with non sequiturs and misrepresentations. You somehow thing that shows a defect in the response. What I see is that it shows that just because people act a certain way about X, that doesn’t mean they are addicted to X. Past that we get into the pizza analogy. You think that the existence of pot already being illegal has some bearing on this. I don’t see it. Yes, this means that the people tried the drug while it was illegal, but those prior bad acts don’t affect the legitimacy of their advocacy. If they had all toked up in Amsterdam, would that change your thoughts on their advocacy or argument? Their is no real difference in our judgment of the advocacy of our pot activists and my supposed post-law pizza activists, but you can’t use ad hominem criminal attacks on the pizza activists. That ties into your claim that illegality is central to your criticism. That might be true in general, but it’s not true about the specific argument that was criticized. To your one specific line of attack that is at issue, it’s completely irrelevant. You know, I don’t think we’ve ever had a coherent comment here that began “LOL”. And the record continues. Should I break it to Glory that the US doesn’t, in fact hunt down people for what they do in their own homes? If there is a single person without a long criminal record in jail for using pot in his own home, rather than distributing it, smuggling or crowing it, I’d be amazed. 1) Other crimes should be irrelevant. 2) You need read your Radley Balko a little closer. Morninglory’s post is representative of the midnight SWAT raids, puppycide, and general viciousnous that personal pot use is subjected to. Oh, and this really was an irrelevant post to start the marijuana thread on again. It’s that stupid hemp quote, as if they didn’t need rope in the 18th century. There are no swat raids for smoking joints. The SWAT raids are reserved for supposedly large, salable stashes. I’ve defended small amount pot users—they simply do not go to jail, unless they are violating parole or probation—and then those other crimes ARE relevant, T.
I didn’t actually say that people are in jail for small quantities of pot. I wouldn’t be surprised if they were, but I don’t have time to research it right now. The SWAT and tactics are not just for dealers. The most salient stories that come to mind are the supreme court case that construed noise in an apartment as a justification for search (the case was about a small amount of marijuana and marijuana scent somewhere on the floor of that apartment complex), the Brooklyn man who was shot by police, unarmed, in his bathroom over a small amount of pot, and the guy in the midwest on trial for attempted murder of a police officer… for shooting at intruders at 5am that turned out to be a SWAT team…over 1 marijuana plant that was grown for marijuana prescribed for his PTSD. Should I mention the thousands of illegal searches of people in New York City specifically aimed at getting them to display small amounts of marijuana in their possession? It’s not actionable to possess it out of sight, but if you take it out of your pocket, even at the direction of a cop, it’s now illegal. Isn’t it amazing how a discussion of the virtues expounded by the first President wandered off so quickly into one of pot and corned beef?! I think some people are just “uncomfortable” when confronted with greatness and virtue in general. BTW: Here’s another quote from President Washington. Now that should REALLY set some folks here to squirming! I think some people are just “uncomfortable” when confronted with greatness and virtue in general. That’s as much as a non sequitur as the pot discussion. BTW: Here’s another quote from President Washington. You tell me, Tiggy. Whenever Christian virtue comes up, you’re the one that starts turning backflips. Me- I embace it. So did Washington. It’s the source of his greatness. Ugh. Why should a pulled out of context quote from George Washington set folks here to squirming? What is your reasoning for thinking this should occur? “Out of context”? Try reading his inaugural addresses. In fact, try reading just about anything he wrote.